It’s hard to believe that Vipassana Hawai’i celebrates 30 years this year. Since the early days in 1984, we as sangha members, directors, teachers, friends, students, and volunteers have quietly grown in tending to its mission. While each year has brought its own blessings, challenges, and wondrous moments, practice, trust, patience, wisdom, generosity and above all a good dose of humor have kept us going. Here’s to 2014, a new vortex of momentum as well as opportunity. We are so aware that this is thanks to all of you who show up for practice, support our programs, and serve the Dhamma tirelessly. Dedicating this newsletter to our generous volunteers and supporters, we invite you to read on! As many of you know, Vipassana Hawai’i has owned 254 acres of property in North Kohala, Hawai“i Island, since 2007. Rich and precious, the land stretches along more than a mile of open coastline, spans two jungle-like stream beds and includes sprawling serene pasture lands, deserving careful stewarding. With some of our acreage now on the market, our intent is to draw like-minded owners, supportive of our work, with heart for the land. Proceeds of property sales will give Vipassana Hawai‘i space to manage its remaining 81 acres with focused excellence and work on its hermitage. For details you may contact us. Once in a while, a volunteer yogi calls the office or sends an email, just wanting to connect. It's always rewarding and makes us realize how much Vipassana Hawai’i counts on its sangha. The truth is, with programs across the world, our connection to each of you is vitally important. So here is our invitation: We love to hear from you. Please drop us a note any time. Let us know how you are doing, how we, from our side, can give you better support. Our deepest appreciation goes to all of you for making our mission flow. 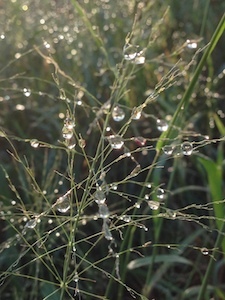 On the last Friday of each month, a group of yogis on O’ahu practice mindful gardening in Palolo Zen Center’s organic garden, grateful for the privilege of practicing at the center (Vipassana Hawai’i’s Hawai’i retreats take place at the Center.). The zendo gardeners include Doug and Cathy Davenport, Niki Miller, Carol Nelson, Quynh Nguyen, and Harry Palmer. 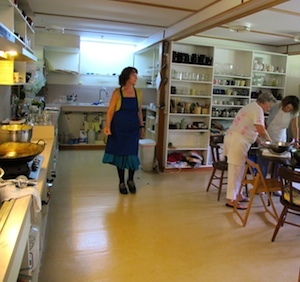 Less organized are North Kohala’s Sunday-sitter gardeners, who tend to a riotous garden on the grounds of the planned Hawai’i Insight Meditation Center, sharing okra and aubergines with any new yogis who happen to stop by. (For information about the Palolo garden group, please e-mail Niki Miller at nikikaneohe@gmail.com.) Thank you everyone. Tasked to record Dhamma talks on site, Tim attends many retreats trailing high-tech equipment. Back home, work continues as he re-listens to the talks to adjust sound quality and edit content for release to the website. 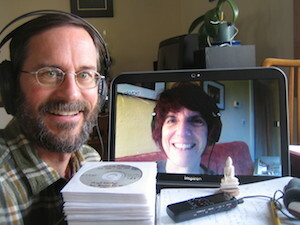 Mary has recently joined Tim to listen and filter through dozens of older talks so we can make them available as well. It's a rigorous process taking countless hours, benefiting many. With deep gratitude, thank you! A grand mahalo goes to Thanh Huynh, Xuan Huynh, Niki Miller, Quynh Nguyen, Mark Nokes, Paula Nokes, Harry Palmer and Gloria Staackman of the O’ahu steering group. With Harry often serving as the main liaison with the VH office in Kohala, the team is instrumental in planning, organizing, and implementing the many events, retreats, and sittings that take place on O’ahu. Thank you! Members of the steering group take on many other tasks. Along with volunteer Steve Diamond, they are a prime resource for publicizing O’ahu retreats, sharing networks, and offering creative skill for beautiful flyers and retreat announcements. Thank you. Gratitude goes to O’ahu’s practice leaders, organized by Mark Nokes and including several of the steering group as well as Pat Masters. Thank you for leading the Sunday sittings on O’ahu! (For information,click here.) Thank you, Cynthia Lee, Cindy Krum, Shereen Kanehisa and Thanh Nguyen for graciously collecting Sunday donations benefiting our host and Vipassana programs. In retreat, food is important. A huge mahalo to all our cooks around the world. On O’ahu, Vipassana Hawai’i has been fortunate to contract with chef Alyssa Moreau, who brings not only sheer joy, beauty and flavor to healthful dishes but leads our cooking volunteers with skill. A great thank-you to Robert Cuthrell. Tirelessly devoted as a retreat volunteer, often quietly in the background is also Domenica Satler: Much, much gratitude. Besides overseeing myriad logistics and bowing to budgets,retreat managers assist our teachers in creating a safe container for yogis to practice. It’s critical work and requires numerous skills infused with wisdom. On behalf of all yogis and all of us at Vipassana Hawai’i, we cannot thank the many retreat managers who have served recently enough: Thank you all! Volunteering at the future home of HIMC has been a Sunday-sit guerrilla effort thus far: A rusty gate needs fixing, the rains have washed out a road, cows have wandered into the meditation tent, facilities need a face-lift. Come out the nails, the shuffles, the mops and brooms. Thank you to all of you who see what needs to be done and then do it. Mahalo, Rick Gordon and Ron Roberts for pushing the mower, clearing debris, sweeping roofs, bringing in tools and materials, doing the heavy lifting. Thank you, Charles Oldfather, for calmly managing the land and its ranchers, steadfastly helping out. A thank you to Orange Cleghorn, Karen Rosen, and Rebecca Lux-Parks for showing that cleaning can be fun. Thank you everyone for showing up! With enormous gratitude to William Bennington, Jake Davis, Fran Morfesis, Luisa Perticucci, and Mia Tremblay for their unwavering support, we invite you to stay tuned to the forthcoming Mettadana 2014 newsletter, which will report more on our retreats, volunteers and volunteer programs in Burma. 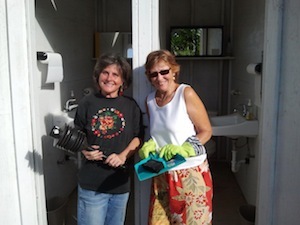 Volunteer photos from top to bottom: Active in and around the Kohala garden. 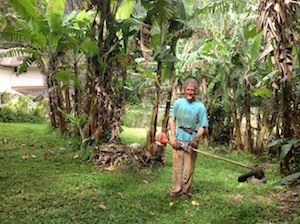 Doug Davenport - Instrumental gardener extraordinaire for the Palolo Zen Garden. 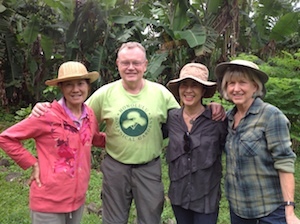 Quynh Nguyen, Harry Palmer, Cathy Davenport, Niki Miller at the PZC garden. Tim Wickens, Mary Zinkin, the audio team. Active in the PZC kitchen. Karen Rosen, Orange Cleghorn. Vipassana Hawai‘i is at an exciting juncture with lots of energy. At this time, we deeply appreciate your help in keeping our programs going. Please contribute today so that Vipassana Hawai‘i can continue to thrive in its mission. Your generosity today will make a difference and is our bridge to the future. Please visit our website donation pages to contribute securely online or write a check to Vipassana Hawai‘i. (Address: PO Box 551681, Kapa‘au, Hawaii 96755). If you wish to set up a recurring gift, please contact us. Thank you for your support! Catching the Mind, with Grahame White. April 4-10, 2014 ~ Location: Palolo Zen Center, Honolulu. We recommend that you register early. To register, please follow this direct link or visit our website. 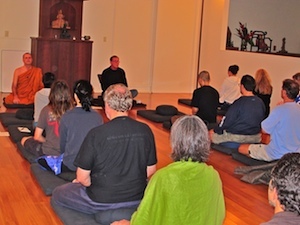 Vipassana Meditation Retreat, a weekend with Steven Smith, Michele McDonald. April 25-27, 2014 ~ Location: Vancouver, BC, UBC Asian Centre, Canada. Vipassana Hawai‘i does not take registrations and inquiries for this retreat directly. Please contact:Westcoast Dharma Society. Metta Vipassana Retreat, with Steven Smith and Michele McDonald, teachers; with Joy Kerfoot, mindful movement. April 30–May 14, 2014 ~ Location: Hollyhock, Cortes Island, Canada. Location: Chan Khong Buddhist Temple, 1105 Hind Iuka Drive, Honolulu. 5:45 – 6:30 – Dhamma talk, sharing reflections, experiences, questions and answers. All of us at Vipassana Hawai‘i express our deepest thanks for your faith, shared commitment, and continuing trust. In gratitude, Steven Smith, Michele McDonald, and Trent Cornell - Board of Directors. Board of Directors ~ Steven Smith, Michele McDonald, Trent Cornell.